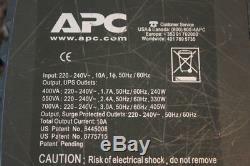 APC BE700 UPS - a small and simple UPS that can provide up to 405watts of power. The unit also encorporates a data cat5 style protection socket, overload trip fuse, simply surge protection on 4 sockets. 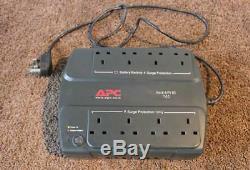 4 Sockets provide surge protection and also full time battery backup. Please note that the unit does have a USB port, but it needs a special Cat5 to USB cable which we do not have. Easy to use, simply plug in and turn on. All of these units refurbished second hand units. Has the added benefit of using standard UK-3 style plugs, which mean they are ideal for supporting routers, cameras, NAS, and any low power device that has a 3pin plug moudled on the end. We are fully testing in house before dispatch. We are including brand new cells at this price. We fit the cells before dispatching. Feedback regarding our packaging is excellent, and we have very few problems with goods being damaged in transit. If there is a problem we fix it straight away for you, at our cost. Thanks for looking The units are fully tested by UPS experts, and are fully working. They are second user and will have cosmetic signs of previous use. We professionally refurbish including paint touch up or case re-spray as needed. The grading is A-Grade which we class as as good as you can get without having new. We have been supplying UPS since 2002 and are the respected leader in the field, with the most used stock in Europe. What sets us apart is that our experience reduces the occurrence of problems, and our professionalism and the availability of resources means we have the power to quickly resolve issues when they do arise. We cover all problems that occur in transit. We have the packing materials to make sure that there are few problems in transit. Our warehouse is based in the UK. 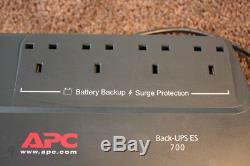 Battery-protected and surge-only outlets Reserves power capacity and run time for connected equipment that require battery back-up while providing surge only protection for less critical equipment Power conditioning Protects connected loads from surges, spikes, lightning, and other power disturbances. Safety-agency approved Ensures the product has been tested and approved to work safely with the connected service provider equipment and within the specified environment. Convenience Audible alarms Provides notification of changing utility power and UPS conditions Automatic self-test Periodic battery self-test ensures early detection of a battery that needs to be replaced. Cold-start capable Provides temporary battery power when the utility power is out. Hot-swappable batteries Ensures clean, uninterrupted power to protected equipment while batteries are being replaced Resettable circuit breakers Enables a quick recovery from overload events. Transformer-block spaced outlets Protect equipment with input transformer blocks without blocking access to other receptacles. 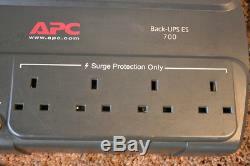 The item "APC BE700 UPS / new batteries / 12M RTB / standard plug" is in sale since Monday, February 5, 2018.